A couple of Saturdays ago I had the distinct pleasure to Guest Post on SkipToMyLou.org. I shared this cute printable as part of a Valentine series, and I think its about time I share it with you! Every year I have TONS of ideas for Valentine’s day. Most of them revolve around candy, -like the Sweet Candy Bottles that were so popular last year, but not this time! Oh no, this time I’m sticking with paper and scissors. There may or may not be candy in there for photography reasons. I may or may not have eaten it all after the photo was taken. 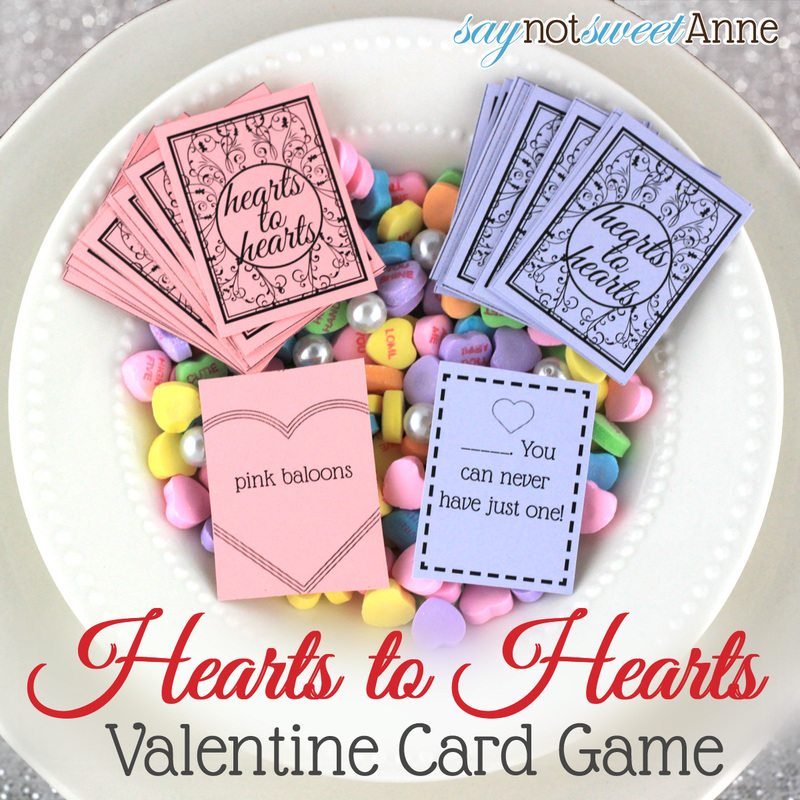 Heart to Hearts plays just like the popular game Apples to Apples . Basically, there are two decks. Each player draws several cards from the “answers” deck. Then, when it’s a player’s turn they draw a card from the “questions” deck and pose that question to the group. The group must answer with one of the answer cards in their deck- hoping to be the most correct out of the bunch. Usually though, the answers and question combinations don’t make the best sense, but are too funny! While I worked my tushie off trying to make sure all the questions and answers are G rated, there are still some funny combos for the dirty minded among us. Still, I rate this game PG at worst- and its so fun! There are some blank question cards that you can use to make up your own funny combos. Maybe include your family name? Two colors of card stock, approx 5 sheets for each deck. Black and white (or color) printer. Download the Answers PDF, the Questions PDF, and the Backs PDF. Print the answers and questions on two different colors of card stock. Run the Question and Answer pages through your printer again, this time printing the Back PDF onto the back side of the card stock. Cut along the lines shown on the back of the cards. That’s it! If you wanted, you could use a corner rounding punch for a little extra pizzazz in your decks. Love this Kayla! I think I am going to make it for the kids!! Great idea. Thanks for making it printer friendly also. I also appreciate the super easy download.